Knowing your Subscribers, and their needs, is a key ingredient to effective email marketing. With a/b testing, we now have way of determining what your Subscribers are positively responding to, giving you a better in-road to solving their pain points. A/B testing is a way to compare two versions of a single variable, (in this case, the subject line of an email), by testing a Subscriber’s response to variable A against variable B. One variable (subject line) will come out on top, with the most clicks. 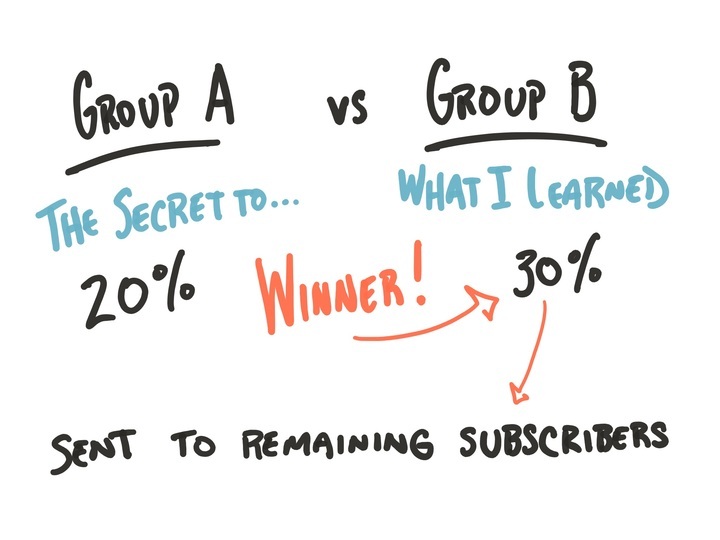 A percentage of Subscribers are randomly selected, and then assigned to one of two subjects. We then determine a winner, based on the open rate of the subject. The remaining recipients (not including that first percentage), will be sent the ‘winning’ variant, (subject line), yielding the highest open rate overall. Think of it as Group A, and Group B. Each group receives a version, or variant, of the subject line, and the subject line with the most clicks is sent to the remaining Subscribers. This testing period occurs over a four hour period of time, so you can zero in on better open rates, in less than a day. NOTE: Once the test is complete, the open numbers will continue to grow and change. You will see the winner banner on the group that won within the 4 hour period, regardless of the overall number, once all opens are counted. Who Is A/B Testing For? If you send your Broadcast to 100 recipients, then each variation would go out to 15 people. With a less-than 50% open rate, only 7 recipients would likely open. This means that the winning subject line would be determined by the whims of a single person. One individual's decision of whether or not to open an email will not provide the best results.